What is the primary trigger that produces uneven teeth? One of the main reasons for crooked teeth is oral muscular dysfunction. Hereditary factors appear to play a much smaller role than we once thought. The upper and lower jawbones are positioned with the lip and cheek muscles outwardly, and the tongue muscle on the inside. When these muscles deviate from their normal function, it can result in the unnatural development of the jawbones due to incorrect forces being placed upon the growing jaws. The normal resting position of the tongue should be against the palate (top of the mouth), applying pressure against the upper jawbone, encouraging it to grow, allowing plenty of space for the adult teeth to grow into their correct positions. Form follows function. On the other hand, if the tongue is situated low in the mouth, the lip and cheek muscles would apply more relative force from the outside, leading to narrower jawbones with limited space for the adult teeth to grow normally, thus creating uneven teeth. Having a low tongue posture could be the result of harmful oral habits (for example, mouth-breathing, thumb-sucking, using dummies, and swallowing incorrectly), lifestyle choices (for example poor diet with soft sloppy, refined foods) or functional issues, (for example, tongue-ties, lip-ties, upper airway obstructions, and inadequate muscle tone) among others. 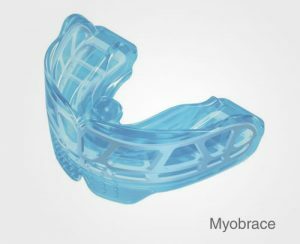 The Myobrace™ and MyoMunchee treatment systems have been designed to correct the oral muscular dysfunction and are particularly successful in children between the ages of 5 and 15 years, who still have a high potential of jawbone development. Sometimes we can even work with children aged 2 to 5 years of age. Treatment objectives are to improve oral function to encourage the jawbones to develop as wide as they can naturally, enhancing the jawbone relationships and sometimes improving facial profiles, while usually preventing the removal of adult teeth (not including wisdom teeth). We aim to prevent jaw surgery at a later stage and limit the requirement for braces as much possible. Our clinical experience shows that if our treatment system is followed properly, then 9 out of 10 kids will be able to avoid braces completely. Operator experience, patient compliance (with exercises known as Oral Myofunctional Therapy and with wearing the appliances prescribed), and individual biological factors all play a role in the success of treatment. Every case is different. To achieve an optimal outcome, one might require seeing an adjunctive health practitioner, for example, these may incorporate breathing educators, neuro-developmental or cranial chiropractors, cranial osteopaths, nutritionists, and Ear Nose and Throat (ENT) specialists, and allergists. At Myofocus, we’re proud to have world-class experienced practitioners as our co-founders and co-owners. Dr Donny Mandrawa and Dr Dan Hanson have both lectured internationally for Myobrace, teaching other practitioners how to best utilise the system. Both have achieved great success in their treatment of malocclusion. Furthermore, Dr Donny and Dr Dan teach the ‘Myofocus System’ to other health professionals. Our fusion of what we consider to be the best of all of the other systems on the market had led to great interest from other dentists who wish to learn how we achieve such fantastic results. If you would like to get more information on Myobrace, please call us on 03 9329 2929 to arrange a consultation.